Indian summers can be unbearable without a good air cooler. Air coolers during summers are a god sent gift. They are cheap, affordable and easy to maintain. In this Best Air Coolers in India Buyer’s Guide – we will explain everything related to air coolers with reviews and ratings. 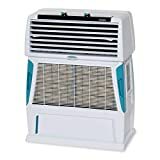 We discuss advantages of air coolers, how to choose the best air cooler as per your room/house size and which are the air cooler brands that give great after sales service and last you a lifetime. If you are in a hurry, go with our top picks. But we strongly recommend that you understand the product you are paying money for! 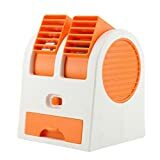 Such mini air coolers are good only for one person. You can just use these air coolers for office use. They will blow cold air only on your face and keep you refreshed. Air coolers also known as desert coolers work on the principle of evaporation. When water gets heated it becomes water vapor. In these air coolers, hot air from outside is passed over cool water. The cool water absorbs the heat of the air and evaporates. The transfer of heat from the air to the water – causes the air temperature to drop. This makes the air inside cool. The fan inside the machine then circulates this cool air around your room. This process gets repeated again and again – making the room cool. This is the basic working of an air cooler. Now, we are not patient! On a hot sunny day – we want the room to be as cold as possible and as fast as possible. So, air coolers now come with cooling pads. The hot air passes through the cooling pads. The water evaporation takes place within these cooling pads. A pump is used to make sure water keeps flowing through these pads. The room temperature drops about 5 to 6 degrees with use of an air cooler. Air coolers work best in hot and dry places like Rajasthan, whole of North India, Madhya Pradesh, Gujarat and Maharashtra. In humid places like Chennai, and Guwahati desert air coolers don’t work properly. Some brands have launched air coolers with humidity control. Such coolers can control humidity to a good extend. Air coolers are cheaper than ACs. They can help you save a lot of money. If you run an AC for 10 to 15 hours a day for 30 days – it will cost you about Rs 3000 to Rs 4000. You can get a good air cooler below Rs 10,000. Your air cooler will pay for itself in a couple of months. Power saving air coolers use very little electricity which will reduce monthly bills. Best energy efficient air coolers in India are now available at affordable prices. They are very environment friendly. Unlike ACs, coolers don’t emit CFCs and other harmful gases. They are an eco friendly choice and don’t add to the growing problem of global warming. You don’t need to spend money to install or service them like ACs. They are portable so you can shift them around the house as per your need. Air coolers work best if you live in a hot and dry place. Size of the cooler is the most important thing to consider. 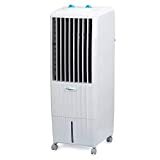 If you buy a very small air cooler and your room size is big – it will take lot of time to cool the room. It will not be effective, and you will get frustrated. So, first check your room size. If you’re living in an apartment then most rooms are usually 1010 (100 sqft), 1212 (124 sqft), or 12*14 (168 sqft). To roughly calculate walk the length of the room. Count the number of steps you took. Do the same for the breath. You get approx sq ft area of your room. #2. Effectiveness of air coolers in Indian climatic conditions. An empty glass of water – can hold only a fixed amount of water. If you keep adding more, what is going to happen? It is going to overflow. It will not be able to hold that water. Similarly, air also has limited capacity. It can also hold only a limited amount of water. Humidity measures how much water is already there in the air. If the air is hot and dry – then the water evaporates and goes into the air. If the air is hot and moist – where is the water going to go? If the air already has enough water, then where will the water from your air cooler go? Nowhere. Write down the size of your room along with your budget. Now, that this is clear – we can see different features and benefits of air coolers. Aspen/Wood Wool/Bhusa: These are the old kinds of cooling pads where the material used is wood shavings. They are 75% efficient. Honeycomb Pads: Here the pattern is in shape of honeycomb. They are quite thick and effective. They absorb water better and allow cooling water faster. They are 85% efficient. Go for coolers that have honeycomb pads at least 90mm thick. To ensure more cool air, new models of air coolers now come with ice cube trays. Ice water goes into the tank with the melting of ice and evaporates faster. If your air cooler has large water tank, it will run for long time. 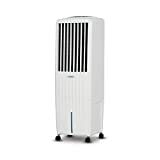 Go for a large capacity air cooler, which you will have to fill only once or twice in a day. Anywhere between 30 to 50 liters is sufficient. Make the Decision: Decide how big a tank you need. In a 30 liters tank you will have to fill water twice a day. In a 50 liters tank, only once a day will be good enough. Air coolers now come with automated water level controllers. They are able to maintain the amount of water within the air cooler. Water level indicators lets you know how much water is left in the water cooler. It makes life easier, as you don’t have to keep opening the cooler to check water level. Empty tank alarm will let you know when water is at less level, so that you can refill. This also helps to prevent damage. Timer helps you save power as well as the energy. You can pre set the time when you want the air cooler to shut down at night. Speed control knobs of High, Medium, Low let you control the temperature and speed of fan. Nowadays, just like ACs, even air coolers come with remotes. You can control speed settings etc without getting up from the bed. Make the Decision: Do you have the budget to spend for more comfort? Then go for a remote controlled one. 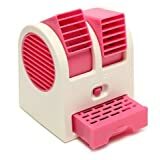 A non touch, without remote control simple air cooler can save you around Rs 3000 to 4000. Power cuts happen a lot in India. Compatibility of air coolers with inverters can be a huge benefit. It is now available on almost all good brands of air coolers. Air coolers consume about 120 watts to 180 watts of electricity only. They can run on inverters unlike ACs. If you already have a 600VA above power of inverter then you can use an air cooler with it. As already explained, air coolers can only control humidity to a certain. You will only need this feature after June/July when monsoon begins. From March to June you can use the air cooler without any humidity control. Some good brands of air coolers have come up with humidity control. 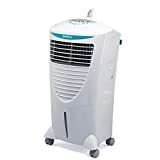 Click here to see best air coolers in India with humidity control. Keep the cooling pads clean every two weeks. You can use a small brush to dust of dirt. If your cooling pads have been in use for a long time, then consider getting new ones. Every week clean the tank before filling in the water. This prevents bacterial growth and mold formation. Mold formation is very harmful for life of coolers. Always fill fresh and clean water in your air coolers. Leave the doors and windows open when using an air cooler. This will ensure better air flow and more cooling. Best place to keep air cooler is in front of a window. This works as a natural humidity controller. Keeping the fan blades will improve the efficiency of your cooler. Use ice to get cool air more quickly.